People that find a church community that shares and supports their spirituality have the best chance of growing in faith in their marriage. Couples are invited to let God work in your relationship now, as an engaged couple, and for the rest of your life as husband and wife. The stages of married life can be compared to Jesus’ Transfiguration, Crucifixion, and Resurrection. Your marriage vows can mean more to you as you grow in the understanding that there is more at work in your lives than just each other. Drawing on the wisdom of Christianity while reflecting on the lived experience of marriage, this segment shows that marriage is a sacrament that will teach us to die and rise over and over and that ultimately Jesus will give us grace as we go through the joys and difficulties of married life. A downloadable resource, Spirituality and Religion in Your Marriage: A Reflective Process for Engaged Couples is included. How will faith in God help us through the stages of married life? What do you think are the most wonderful, positive, joyous parts of married life? What do you think are the most challenging, difficult, wrenching parts of married life? Have you seen stages of dying and rising in your relationship so far? Are we similar to each other in areas of religion and spirituality? 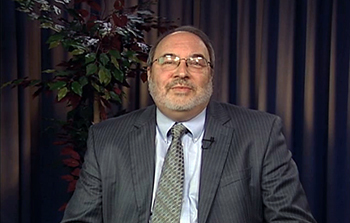 James Healy, PhD, is the Director of the Center for Family Ministries of the Diocese of Joliet. Dr. Healy is a popular speaker on marriage and has in over 70 dioceses across the country. His marriage preparation and enrichment booklets and CDs include How to Get Married and Stay Engaged CD and Living Together and Christian Commitment(which is a free downloadable with this program), and his materials are used by dioceses, parishes, and couples throughout the United States and the world. Since 1989, Dr. Healy has been the director of the Center for Family Ministry of the Catholic Diocese of Joliet, Illinois. He received his M.A. in the Social Sciences from the University of Chicago in 1978 and his Ph.D. in Counseling Psychology from the University of Illinois in 1985. He has written for such magazines as Family Perspectives, Marriage, Liguorian, Catholic World, and Deacon Digest and is also an online contributor to the Catholic Bishops’ marriage website: www.ForYourMarriage.com and to www.EveryDayCatholic.org. Dr. Healy was the founding president of Illinois Catholic Family Ministries, and has served as an advisor to the National Council of Catholic Bishops’ Committee on Marriage and the Family. He was honored with the 2000 Family Ministry Award by the National Association of Catholic Family Life Ministers. He and his wife Madonna have four children.